With a population of around 94 million, a government aspiring to reach middle-income status within a decade and real GDP growth forecast to average 7% a year in 2015—2019, Ethiopia offers enormous growth potential across a number of different sectors. Having topped USD950 million in 2013/2014, foreign direct investment is adding further dynamism to one of Africa’s fastest growing economies. In 2010, the government set out its first ambitious five-year Growth and Transformation Plan (GTP) in a bid to foster balanced sustainable development. In the last five years, the economy has expanded by almost 75%, benefitting broad segments of the population. Accounting for a quarter of national and 40% of agricultural GDP, livestock play a crucial role in national development. At more than 50 million, Ethiopia’s livestock population is the largest in Africa and eighth largest globally. Mixed crop-livestock farmers comprise more than 80% of the rural population and supply most of the country’s food. And since 2010, the production of commercial livestock products—meat and milk, skins and hides, and poultry—has increased by more than 50%. Ethiopia stands at a crossroads. While rising economic prosperity from a growing urban middle class engenders demand for livestock products, recurrent and widespread drought illustrates the country’s vulnerability to climate and other shocks. Enabling smallholder farmers to produce competitively priced, safe and nutritious livestock products offers sustainable solutions to these potential economic, environmental, social and health challenges facing the country. According to scientists at the International Livestock Research Institute (ILRI), which has a principal campus in Addis Ababa, well-targeted and sustainable agricultural interventions—particularly in livestock breeding, health and feeding and in further developing national and local capacities in livestock research and development—will help Ethiopia’s smallholder farmers and herders massively improve the country’s food production, helping to move more than two million livestock-keeping family households into market-oriented systems and adding value to Ethiopia’s emerging animal-source food processing and marketing sectors. And of course to the economy as a whole. Despite the impressive progress in recent years, livestock productivity in Ethiopia remains very low. A recent ILRI study showed that the average dairy-farm household in Ethiopia is only half as productive as their most productive counterparts in the country. Demand for animal-source foods continues to rise faster than supply, particularly for meat and eggs, and food deficits are projected to increase over time unless the major challenges to the country’s livestock sector in the areas of animal feed, health, genetics, and policies and the institutional environment are addressed within the context of a sustainable systems approach. Well-fed and healthy animals produce more. Feed shortages, particularly in Ethiopia’s lowland, drought-prone rangelands, have perhaps been the most critical constraint to increasing livestock productivity and development. Frequent outbreaks of endemic diseases, aggravated by a lack of frontline veterinary services and drugs, have increased livestock mortality and morbidity, reduced fertility and slowed growth, significantly impacting livelihood opportunities and food security. Ethiopia has already begun responding to these challenges by implementing policies facilitating greater farmer involvement in improved feed production and contributing to increased milk supplies to dairy processors. Progress has also been made in liberalizing the country’s veterinary services, adhering better to international food safety and disease standards, and increasing the numbers of veterinary graduates. Even though research by livestock experts in Ethiopian institutes and ILRI have demonstrated the potential of experimental breeding programs, greater incentives in the form of loans, grants, land, tax-free equipment, etc., will be needed to realize the full potential benefits of modern genetics nationally. The rapid pace of change in the livestock sector, among other factors, has hindered capacity to support private-sector involvement in animal health; and shortages of suitable land have constrained the activities of livestock-related agribusiness producers and processors. Land shortages have principally reduced potential output of badly-needed animal feed. Realizing Ethiopia’s middle-income status ambitions will largely depend on the country’s effectiveness in opening up key markets to strategic investments, regulating animal health and food safety sectors, and creating an environment in which productivity increases become synonymous with environmental sustainability. The sustainable intensification of integrated farming systems—specifically livestock production—offers significant benefits to Ethiopia in terms of food security, incomes, opportunities for trade, smallholder competitiveness, and ecosystem services. 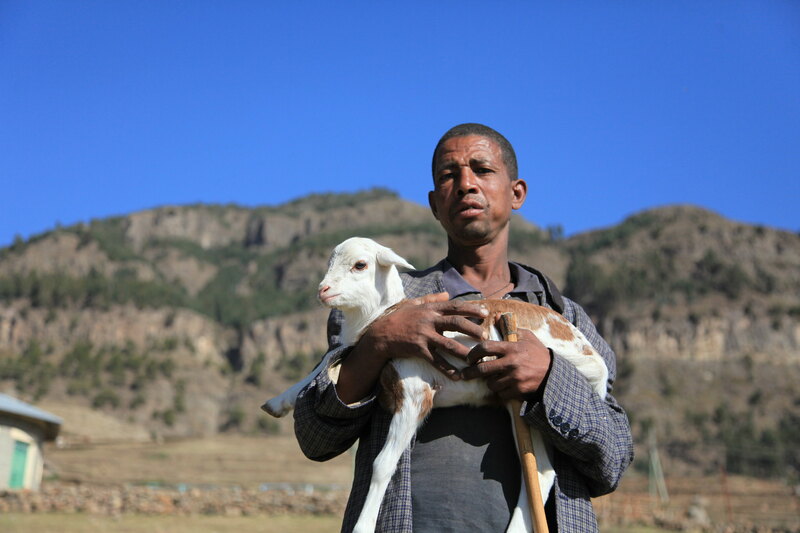 Overcoming low livestock and crop yields, and protecting the environment and farmers from external climate shocks, are essential to the transformation of Ethiopian agriculture. The following are particularly needed. Enhance livestock reproduction. Facilitate widespread adoption of improved artificial insemination technologies and genetic selection techniques to increase livestock productivity. Trials undertaken by ILRI and its Ethiopian partners have demonstrated that by synchronizing breeding and artificial insemination procedures together, pregnancy rates increased by up to 300%. Ability to schedule these techniques has helped time animal births to meet peaks in market demand and feed supply. Intercrop feed and food crops. Help smallholder farmers intercrop livestock feed crops with crops for human consumption in a productive and environmentally sustainable manner. For instance, ILRI research demonstrates that intercropping fruit with short maturing crops, such as vegetables and leguminous fodder species, brings multiple benefits: it increases producer incomes, improves soil fertility and enhances water-use productivity. And effective storage and treatment of fodder increases the availability of year-round low-cost feed, while combatting environmental degradation and increasing livestock productivity. Provide livestock insurance. Promote the provision of insurance that triggers payments to herder policyholders at the onset of severe droughts. Index-based livestock insurance provides a valuable safety net, protecting families from having to take drastic measures during times of drought, such as divesting themselves of their last remaining animal assets. Insured households in southern and eastern Ethiopia, according to ILRI studies, demonstrated more than 25% reductions in distress sales of livestock assets and dependence on food aid, and experienced significant nutritional benefits as well. Reduced risk of drought encouraged insured households to invest more in their livestock, such as by spending more on veterinary care, which in turn increased total incomes from sales of livestock products. Public sector officials, researchers, smallholder farmers and large-scale specialized farmers, processors and other service providers (feeds, veterinary services, etc.) can play complementary roles in transforming Ethiopia’s livestock sector. Involving all relevant stakeholders in livestock development will accelerate local adoption of appropriate research-based technologies and the transfer of knowledge along Ethiopia’s livestock value chains. Ethiopia is well-placed to lead Africa in harnessing the contribution of the livestock sector to maximize food and nutritional security, reduce poverty and develop sustainable farming. The recent publication of the Ethiopia livestock master plan indicates that it is gearing up to do so. Tags: livestock master plan. Bookmark the permalink. Love to contribute in the area of Animal Health, Food Safety, Food Security, Zoonoses Control and Livestock Value Chain Management.